ReachOut Nigeria 2012 Campaign - Sharing in Love, the Word of God via the messenger Angel, "Rhapsody of Realities" daily devotional. Fully packed with revelation knowledge of the Word of God. Be a part of it! God bless you. On the 1st of October of every year in Nigeria, Nigerians mark and celebrate their Independence day; very colorful, happy and celebrated day. This is also a great opportunity to celebrate it with the "Rhapsody of Realities" daily devotional(the Messenger Angel) powered ReachOut Nigeria Campaign programme of Christ Embassy International. Sharing God's Word with Love! Blessing the Nation with the Word of God and the fullness of His power. The previous ReachOut Nigeria campaign was great, interestingly, "the latter shall be greater than the former" in Jesus' Name. Amen. The Reachout Nigeria 2012 campaign of Christ Embassy Nigeria shares 15 million copies of printed Rhapsody of Realities daily devotional nationwide, so go get your own copy of the October 2012 edition today. It's free! 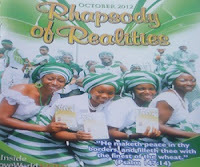 ReachOut Nigeria 2012 Campaign with "Rhapsody of Realities" is truly a blessing. @Anonymous, you're welcome. Mail sent. Please next time, use the contact me form to send such request. Thank you. We thank God for His love and kindness. ReachOut Nigeria 2012 campaign to mark Nigeria @52 Independence anniversary indeed was a success. The free distribution of "Rhapsody of Realities" daily devotional is basically to promote patriotism, and to give lives a meaning via the Word . God bless Nigeria! It can only get better!